The sanding sugar sets from Martha by Mail offered 6 shades of coarse & fine sanding sugar (12 bottles total) and eight 1 oz. bottles of paste food coloring, which made it possible for the baker to decorate a myriad of desserts. These two cards were included in those sets; they show many unique sugar cookies decorated with slightly different techniques. Take a look. 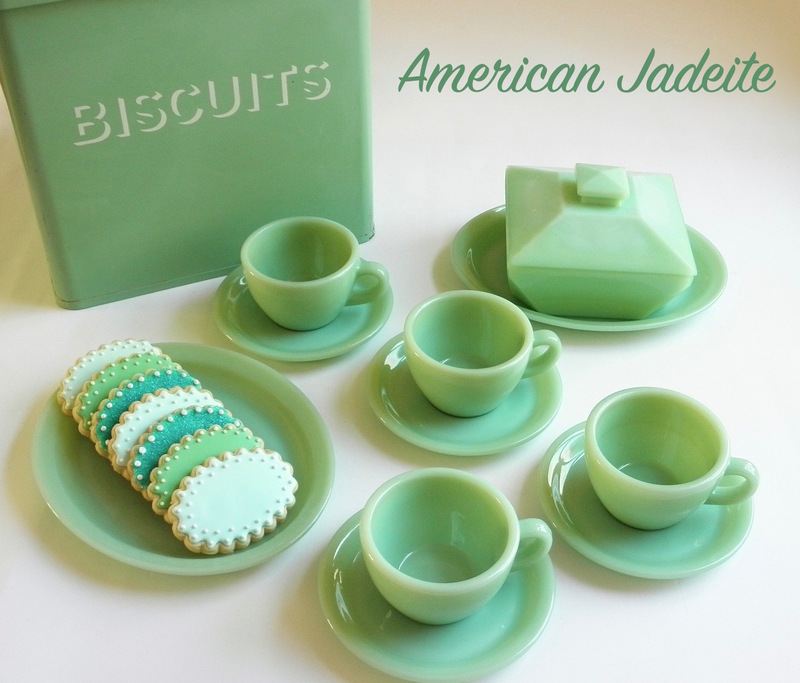 ﻿These cookies were made using our Leaf Cookie-Cutter Set and extra fine sugar (Pastel-Colors Sanding-Sugar Set and cutters are available through Martha by Mail), and royal icing or egg whites to make sugar stick. Raw egg whites should not be used on cookies for pregnant women, infants, the elderly, or anyone whose health is compromised. Sugared (leaves 3, 7, 9, and 12) For a simple sugared effect (3), brush a think layer of beaten egg white on a baked cookie. While still wet, "flock" or dust with sanding sugar. Let dry, and tap off excess. For half-sugared (7,9, and 12), brush egg white on one part. Flock with sugar, let dry, and tap off excess. Outline and "flood" or fill in the remaining surface with thin icing (7 & 9), and flock with sugar in a similar color. Or leave surface unsugared (12). Flocked (leaf 1) Flood cookie and flock with sugar. Let dry, and tap off excess. Two-Toned Flocking (leaves 2, 6, and 8) For a raised design (2), outline and flood cookie; flock with sugar. Let dry; tap off excess. Pipe a contrasting color. Dust with sugar, let dry, then tap off excess. For two halves (6 & 8), outline and flood one side; dust with sugar. Let dry; tap off excess. Flood contrasting color on the other half (if you like, leaving a center "vein"); flock. Let dry; tap off excess. Combinations (leaves 5, 10, and 11) For a flocked design (5 & 10), outline and flood cookie. Once dry, pipe a design. Flock with sugar, let dry, and tap off excess. For half and half (11), outline and flood one side. Flock with sugar; let dry. Tap off excess, then outline and flood the other half with the same color. Veined (leaves 4 and 11) Create a raised vein design (4) by piping thick icing up the cookie center, and then out from the same line. Flock with sugar. Let dry, then tap off excess. Add rows of contrasting dots between lines, and flock with sugar in a similar color. Or invert this vein design (11) by leaving blank spaces to simulate veins on a real leaf when flooding the cookie. Flocking: Sprinkling sanding sugar on top of wet icing creates an effect like flocked velvet. Pipe designs, or flood cookie. Sprinkle sanding sugar over icing. Tap off excess sugar (saving it for the next cookie), then allow to dry 1 or 2 hours. 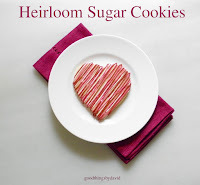 Sugaring: For subtle sparkle, dust sugar over dough before baking, or lightly brush baked cookies with beaten egg white, then sprinkle with sugar. Allow to dry for at least 2 minutes before tapping off excess sugar. Two-Tone Combinations: Brush half a cookie with egg white, then sugar it. Allow to dry for several minutes, and tap off excess. Flood other half with icing. Consistency may be thinned by adding water. Add two or three drops of gel food coloring after mixture is smooth. It can be stored, covered, at room temperature for up to 2 weeks. Place meringue powder, and a scant 1/2 cup water in bowl of electric mixer fitted with paddle attachment. Whisk mixture on low until combined. Add sugar, scraping sides of bowl as needed; beat until soft peaks form and mixture is smooth, 10 minutes. I know a Good Thing when I see it. Over a decade ago I came across Martha by Mail and instantly became captivated by the beautiful & exclusive product line offered in that catalog. Shortly thereafter I began to collect passionately many pieces of glassware, earthenware, copper cookie cutters, etc., from Martha by Mail, not only to beautify and enhance my home, but to create, share and gift many Good Things for the people I love most. Little did I know at the time that Martha by Mail would one day cease to exist, but alas, in 2004 the catalog came to an end. Many of the beautifully designed products became instant collector's items in a matter of months. I have witnessed many pieces increase in value and desirability since the catalog's closing. Truth be told, certain items are beyond my reach now, but nevertheless, I cherish what I do own. I also use and take very good care of my collection from Martha by Mail. It is my wish to share with you, not only pieces of this very personal collection, but also the many items that were produced for the exclusive catalog. Look at this new page dedicated to the Martha by Mail label as a source and as a guide. 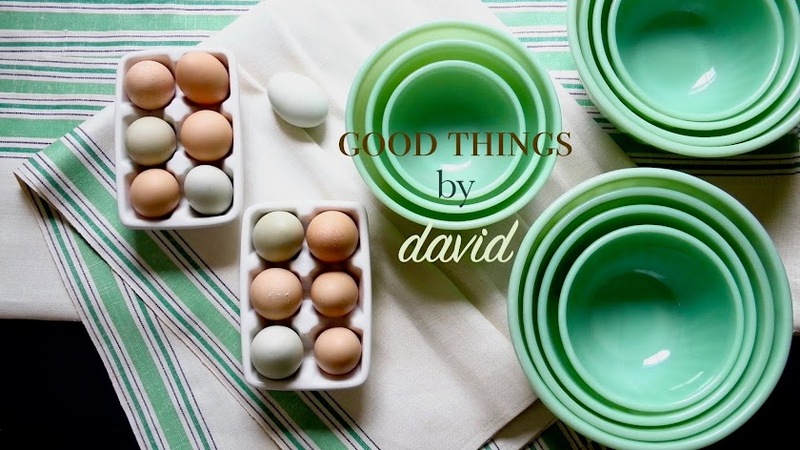 For the admirer, designer, baker or cook, it may inspire you to create something new. For the discerning and avid collector, I certainly hope you find it informative & useful. I think once you revisit Martha by Mail (later called The Catalog for Living) you will agree with me that for the years it was available and in production, it indeed was a very Good Thing. When I was thinking of making this sausage & bean stew, I turned to my mother. It isn't unusual for us to discuss food during our daily chats over the phone, so recently the conversation turned to beans. Her favorites at the moment include black beans & Peruvian beans (also called canary beans) that are slowly simmered until tender. What kind do I like? I also love black beans as much as mom does, but I also crave pink beans, cannellinis, Roman, pinto, navy, garbanzos and lentils. It's sometimes easier and more convenient to make bean dishes with canned beans, but if you plan just a bit ahead of time, dried beans are even tastier. If I know I'm going to cook beans a certain day, I always pick them over the night before (usually after I've cleaned up after dinner) and soak them in a large bowl with plenty of water (at least 3 times the amount of beans); any beans that float should be discarded. The bowl is left out at room temperature. The following day, I drain the beans & discard all of the soaking water. I then place the beans in a large dutch oven or wide stock pot & cover with cold water. You want 1" of water above the beans. Turn on your flame to high & bring them up to a simmer. 1. In a dry nonstick skillet over medium-low heat, fry the bacon until all of the fat is rendered and it is nicely browned (you don't want the bacon to burn so watch your flame), about 10 minutes. Set aside on a paper toweled plate & coarsely chop when cool enough to handle. 2. Discard all but 1 tablespoon of bacon fat in the frying pan (if you don't have enough - turkey bacon doesn't render fat like pork - add 1 tablespoon canola oil) and fry the onion & jalapeños until soft, 5-7 minutes. 3. Add all of your ingredients, except the smoked sausage, into the pot of beans. When everything comes to just under a boil, lower your heat and simmer. The beans will take anywhere from 1-2 hours to become tender. Halfway through cooking, I add 1 teaspoon of salt & give the beans a good stir. 4. As soon as the beans are tender, add the sliced sausage. Since smoked kielbasa is already cooked you only want to heat it through. This should take about 10 minutes. Taste for seasoning and add a few pinches of ground black pepper to taste. The stew is ready to serve. Ladle into bowls and serve hot. My favorite way to eat this type of dish? Served over steamed rice (quinoa is also good) with just a bit of the cooking liquid. Add some chopped cilantro to garnish and tuck a large, generous spoon. Enjoy! Go back to the basics and use dried legumes to cook my Sausage & Bean stew. A long, slow simmer and just a handful of ingredients is all you need to make a tasty dish for dinner. Your kitchen will entice everyone with the inviting smell of simmering, tender beans and savory, smoked sausage. When serving, add as much of the cooking liquid as your loved ones want or serve them with no liquid. Pour a glass of pinot noir and voilà, dinner is served. Now that Halloween is right around the corner, let's scare up some wonderful cookies in these adorable shapes. The American-made solid copper cutters were part of the Martha by Mail catalog beginning in the late 90s. Designed for Halloween, these large (almost 8" in size) creatures provide bakers with a large canvas on which to decorate. If you're lucky enough to own a set of these collector's items, make several spooky cookies for special trick-or-treaters in your neighborhood. There happen to be a few little ghouls and goblins in my family who would enjoy having a few of these this Halloween, so I'm going to start baking very soon. A photo from the Martha by Mail catalog. The bat is covered in black royal icing & is flocked with ink black sanding sugar. Simple white dots make up the eyes. The sugar cookie owl is given a coffee-colored head, small tufted ears, two giant round eyes & a quadrilateral beak. Dark chocolate wings are flooded with icing and white dots are piped around their perimeter. With a toothpick, the dots are dragged & given the appearance of bleeding hearts. Truly unique. The back side of the cutters have large handles with appropriate names for each creature. If your cutters need a bit of polishing (these do! ), follow my directions. This image from Martha Stewart Living shows an array of chocolate & gingerbread flavored bats decorated with royal icing. Eerie, spooky & positively delicious. These wise feathered friends are keeping each other company high atop a branch. With their giant eyes they can see everything down below. As the picture suggests, the owls can be as whimsical and interpretive as you want them to be. I always make Butternut Squash Soup with freshly roasted purée and serve it in my thick porcelain Pillivuyt bowls as soon as I find great squashes. I showed you in a previous post how simple and delicious roasted butternut squash is, so why not turn some of that purée into soup? For a spectacular dinner serve this with a good piece of buttered artisanal bread and a fresh salad. My version of this soup uses one of the basic French foundations in cooking: a delicious and easy mirepoix. Treat yourself & your families to a bowl of this soul warming soup while butternut squashes are plentiful. I guarantee you're going to like it. In a 4 qt. sauce pot over medium heat, sauté the carrot, onion & celery in 1 tablespoon extra virgin olive oil until the vegetables have softened, about 5 minutes. This "trinity" of vegetables is called a mirepoix in French and is the foundation for so many soups & classic sauces. Salt & pepper to taste, then add the minced garlic and stir until fragrant, about 30 seconds. Add the chicken stock & sprig of thyme to the pot & raise the heat. Bring the mixture up to a simmer, cover the pot with a lid & lower your heat. Simmer for 15 minutes, just until the mirepoix has softened completely. Remove the thyme sprig & discard. Strain the mixture into a medium-sized, heatproof bowl using a fine mesh sieve. Purée the mirepoix with 1 cup of the reserved stock in a blender or a food processor until it is smooth. Note: When blending hot liquids you must provide a means of escape for the heat, so leave the lid slightly ajar and drape a kitchen towel over the opening to prevent any burns. Have the 2 cups of Roasted Butternut Squash ready. Return the pureed mirepoix and all of the chicken stock to the sauce pot, and mix with your butternut squash purée. Salt & pepper the soup and bring it up to a simmer. I find that it only needs a few minutes simmering on the stove before it's ready to serve. Note: if you find the soup too thick for your liking, you can thin it out with some more stock, some milk or cream. You decide what consistency you like. I know it's tempting to buy premade Butternut Squash Soup from markets and restaurants, but you shouldn't have to settle for it after seeing how simple it is to make at home. There are many versions of this soup and I like them all for the most part. To my mind, the pure flavor of butternut squash should come through in this type of soup. I don't want to have too many other flavors competing with each other. You can enhance & boost the flavor, if you wish, with other herbs or perhaps a dollop of crème fraîche or even some yogurt. Some crumbled bacon is certainly welcomed and quite delicious. I hope this soup has managed to capture your attention and taste buds. Make it for dinner this weekend and let me know what you think. Bon appétit! Squashes of all types, Cucurbitaceae, are arriving at supermarkets now and should be enjoyed without a moment to lose. I'm always looking out for beautiful butternut squashes to roast and serve to my family throughout fall and winter. There's something about roasting these Cucurbita muschata around this time of year that makes my home seem a little bit cozier & nicer. A good source of Vitamin A, E, C, and fiber, butternut squashes are not only nutritionally beneficial for you, they're also very tasty. Apart from that, roasting this squash is the easiest thing in the world. Let me show you what I do in my kitchen. Preheat your oven to 425°F. Cut your butternut squash in half, lengthwise, with a very sharp chef's knife (be careful!) & scoop out the seeds. Note: I'm roasting squashes that weigh between 2 to 3 lbs. Place the squash cut side down on a parchment lined baking sheet & roast for approximately 45 minutes, or until the halves can be pierced with a knife all the way through. As soon as the they're cool enough to handle (after about 20 minutes or so), remove the skins with a spoon to expose the flesh. You can also turn them over & scoop out the flesh. Note: At this point, they're wonderful to have as a side dish if left in big chunks. Simply dot with a little bit of butter, and salt & pepper to taste. Delicious. Place the peeled squash in the bowl of your food processor & purée until smooth. You may have to pulse this several times & scrape down your bowl. At this point, I let the purée cool completely & then freeze it in 1 cup portions for later use. This is the type of purée I reach for if I'm making a pumpkin pie or my delicious pumpkin bread. It's also perfect for my Butternut Squash Soup. You can, of course, serve this purée to your baby or toddler as is, or as a side (dot with butter) at dinner time. As soon as you spot butternut squashes or any other type of Cucurbitaceae at your local supermarket, buy a few of them. Roast the squashes in the oven and either serve as is, or create something else with their delicious flesh. It doesn't take much to coax the full flavor of butternut squash, but if you want to enhance this vegetable you can try a few fresh herbs. Sage & thyme are naturals, but should be added sparingly to your dish. I also like rosemary and flat leaf parsley with my butternut squash; let your taste buds guide your preferences. Do I need to tell you that cream & butter are exquisite with butternut squash? Whatever you decide to add to this vegetable, remember these words: make it your own & enjoy! This recipe is one that I turn to again & again. It comes from the Martha Stewart Baking Handbook and is just one of the many great recipes found in this must-have book. As a matter of fact, it's my brother Erik's all-time favorite cookie. It has to be included on the Christmas table when I visit him & the family, but I also get requests for it during the year. I think it's the combination of pure maple syrup (Vermont maple syrup is delicious) and delicious flaked coconut that makes this cookie extra special. Martha's recipe calls for raisins, but quite honestly, you can substitute your favorite dried fruit. The ones I made below had cranberries in the mix because they were going to my special niece, Audrey (she loves cranberries! ), who needed a bit of cheering up. Enjoy them! Martha's Oatmeal Cookies. Simply delicious! Makes about 2 dozen These classic drop cookies are large, soft and chewy. Look for Grade B maple syrup, which has a deeper flavor than Grade A. 1.) Preheat the oven to 325°F, with racks in the upper and lower thirds. Line two baking sheets with parchment paper; set aside. In a medium bowl whisk together the flour, cinnamon, baking soda, and salt; stir in the coconut. Set aside. 2.) In the bowl of an electric stand mixer fitted with the paddle attachment, beat the butter and brown sugar on medium speed until light and fluffy, 3-4 minutes. Add the maple syrup, and mix to combine. Add the egg and vanilla; beat until well combined, about 1 minute, scraping down the sides of the bowl as needed. 3.) With the mixer on low speed, add the flour mixture in two batches; mix until just combined. Add oats and raisins; mix until just combined. 4.) Shape 3 level tablespoons of dough at a time into 1 1/2" balls (or use a 2" ice cream scoop) and place 2 inches apart on prepared baking sheets. Bake, rotating sheets halfway through, until golden brown, 15 to 20 minutes. Let cookies cool on sheets for 2 minutes, then transfer parchment and cookies to a wire rack to cool completely. Cookies can be kept in an airtight container at room temperature for up to 4 days. The cookie dough full of Good Things. An ice cream scoop always gives a consistent sized cookie. One dozen cookies per sheet. Fresh out of the oven. Cookies cooling on racks before being mailed out. I'm telling you, these are superb!